For Hiro Mashima, making manga is his true calling. Just from reading his bestselling epic about the world of wizards, Fairy Tail, you can sense how devoted he is to his work. Meeting him in person, you encounter more to his personality that explains how he can make such a manga. He’s a forever-humble student of life as well as a big-hearted teacher, fascinated by the making of manga more than anybody. This perfect balance is the ultimate drive that keeps him working on a long-running—and sometimes even multiple—manga series. 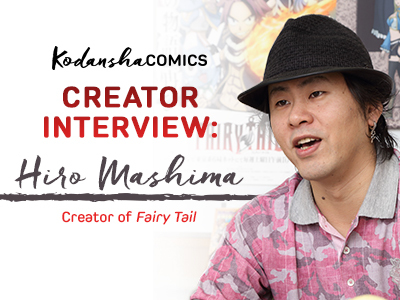 This interview is for old and new fans of Fairy Tail, who wants to know a little more about the personal side of Mashima-sensei! Born in 1977 and debuted as a manga-ka (manga artist) in 1998. His first long-running series, Rave Master, ran in Weekly Shonen Magazine from 1999 to 2005. 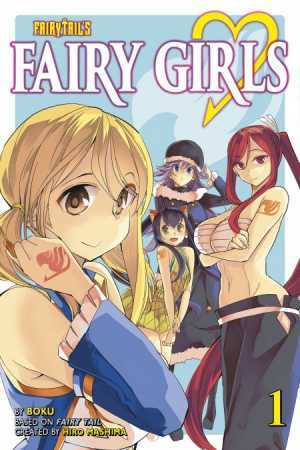 He serialized his current series, Fairy Tail, in the same magazine since 2006. When Fairy Tail was adapted as an anime series in 2009, it became a global hit. Other renowned works includes Monster Hunter Orage, Monster Soul, and Mashima-en. Kodansha Comics (KC): What was it like when you were a kid? Hiro Mashima (HM): When I was little, I was an indoor kid. I always loved doing something at home. Of course I liked to play outside with friends too, but I enjoyed drawing or playing video games, doing something that takes imagination at home. KC: When did you pick up drawing? HM: I’ve been drawing as long as I can remember. I have an early memory of my grandfather showing me a manga magazine that he picked up somewhere. I thought the drawings in it was so cool, so I tried to copy it. That’s probably when I realized that I love to draw. And I still love to draw! KC: Story or art; which one comes more naturally to you? HM: That’s a tough one. They are both really fun. When I make a story, I’m rolling out my imagination to figure out what’s going to happen, and that’s really fun. When I draw, I go through a lot of trial and error to get something to look cool or cute. That’s also fun. I love and am fascinated by the whole process of making manga. KC: Do you think about anything particular when you draw? HM: I’m actually not very good at drawing female characters. I want to draw them so cute I feel a lot of pressure drawing them. In contrast, guy characters are easy. I can just draw them quickly. KC: How did you come up with the world of Fairy Tail? HM: It actually goes back to the series I worked on before, Rave Master. In one episode, there was a scene where a group of guys are hanging out at a bar. That was fun to draw. So I wanted to draw a manga with the feel of guys hanging out at a bar. I thought it’d be interesting to enter a world where characters have established relationships, like friendship. Usually a shonen manga starts with just a main character, who then slowly accumulates his or her allies as the story progresses. But in the world of Fairy Tail, everybody pretty much knows each other at the beginning. That was sort of what I was going for. KC: Is it difficult to work with a story that’s set in a fantasy world with things like magic? HM: It’s not hard, because in a world with magic, you can pretty much do anything! It’s actually harder for me to work on a story that’s set in real life, because there are a lot of restrictions. For example, in a real-life setting, in order to walk into a room, you have to open the door. But in a fantasy setting, you can enter the room however you want. Literally anything goes. KC: How would you describe the main characters of Fairy Tail? HM: They are real trouble. [laughs] At first I was trying to make the characters people I want to be friends with. But from anyone else’s eyes, they’re serious troublemakers. They won’t listen to anyone. Still, I want them to be people to look up to to for kids who read the manga. KC: Do you feel like there’s some resemblance of yourself to the characters? KC: How do you keep your motivation for work? HM: I try to have fun every now and then. I take a lot of breaks and do something else for a change. Also, I’m sure every creator feels this way, but the readers’ voices that I receive from fan letters are very encouraging to me. It makes me want to keep making manga that people can enjoy. KC: Do you have a certain audience in mind when you make manga? HM: I try to make manga that’s fun for teenagers, but I also want it to be interesting enough for adults too. KC: I’ve heard that Miki Yoshikawa (creator of Yamada-kun and the Seven Witches) was your assistant back in the day. What was it like to work with her? HM: Miki Yoshikawa always had a great imagination. For example, whenever I ask an assistant to draw a background in a panel, I’ll usually give some specific direction of what I’m thinking. But every time she drew something for me, it’d always surpass my expectation. She’d add tiny little details in the scene—even something simple like a duck in the background—that I didn’t ask for. She did this constantly. She was still pretty young back then, so she knew her art still needed some work. But I don’t really remember teaching her anything, because she already had what it takes. I think we spent most of the time doing fun stuff, like playing video games together. Although, I always hoped that she’d start her own manga series someday. KC: How many assistants do you work with now? HM: Recently we’ve lost one person, so there are three assistants now. It’s tough not having a full team. KC: Do you like to use digital or analog tools for drawing? HM: Most of my manga is drawn by hand. But sometimes I do try to play around with illustration programs like Photoshop and ComicStudio. Even then, I try to make it look like it was drawn and colored by hand. I try to avoid using any effects that are only possible by digital tools. My favorite tool is still Copic pens though. But it’s a very hard medium to work with, and there are people who are better at it than me. I know the limits of my own ability, so I try to make the best of it. KC: Have you been playing any video games recently? KC: What’s your zodiac sign? HM: I’m a Taurus! Actually, there’s a character names Taurus in Fairy Tail. So I wanted to make sure he’s super-powerful. KC: If a new person wants to get into reading Fairy Tail now, how would you recommend they dive into the series? HM: I think the best way to get into Fairy Tail is to find your own favorite character. I try to make every character to be unique, so they may appeal to different kinds of people. KC: Do you have any comments for fans? 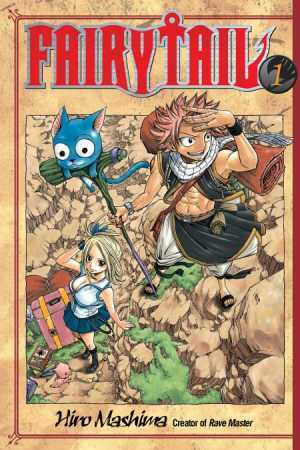 HM: I feel so happy people outside of Japan read and know about Fairy Tail. When I’m on Twitter, I get comments from fans all around the world. That’s really encouraging. I don’t understand other languages too well, but sometimes I try to read and write in English. Or sometimes I try to post some art, because language doesn’t matter. It’s one of the ways to give back to the fans. I hope you guys will continue to enjoy and support Fairy Tail! Want to watch Mashima-sensei in action? You can watch the sketch video here. 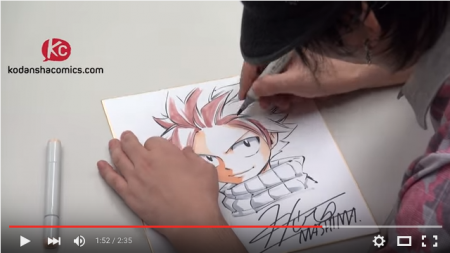 You can also win the autographed sketch Hiro Mashima draws in the video. All you have to do is take this survey. 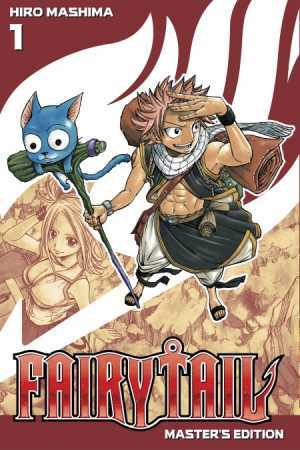 Fairy Tail volumes 1 through 51 by Hiro Mashima are available from Kodansha Comics. New to the world of Fairy Tail? Catch up to the story with the 5-volumes-in-1 Master’s Edition! 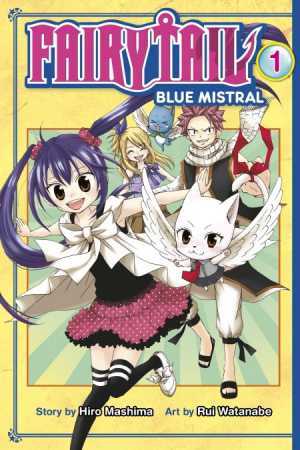 Also, don’t forget to check out the spin-off series of Fairy Tail! 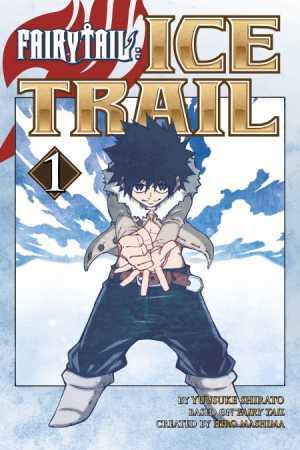 Also the latest chapter of Fairy Tail is available on Crunchyroll Manga!